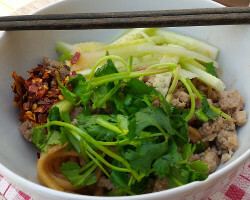 Sichuan Dan Dan noodles is one of our favorite noodle dishes on a hot summer day. Tangy from the black vinegar, and rich from the sesame seed and soybean pastes. We have the noodles luke warm, topped with cool cucumbers and cilantro,and of course more hot chili oil on top. My version omits the hot stock sometimes added at the end, so that it is a drier version. It also omits the preserved vegetables sometimes added in more traditional versions, to accommodate the more picky members of my family. These noodles are great on cool day. My family tend to like tangy foods, so I increased the amount of vinegar used, which I find helps lighten the rich flavor of the sesame paste. I use cucumbers as a garnish in this recipe, which, in my opinion, also helps lighten the flavor and cools down the dish. Great for a hot summer day!